youth are powerful. youth are intelligent. youth are probably more creative than the rest of us. i hold space for them to make, to grow, to ask questions, to fail, to succeed, to revolt, to challenge. Katrina serves as the lead teaching artist for Free Street Theater's youth ensemble. There, she leads youth ages 13-19 from around the city through a year long process which offers a conservatory level theatre training and teaches and engages youth in research and critical thinking. The ensemble consists of 15-20 ensemble members. 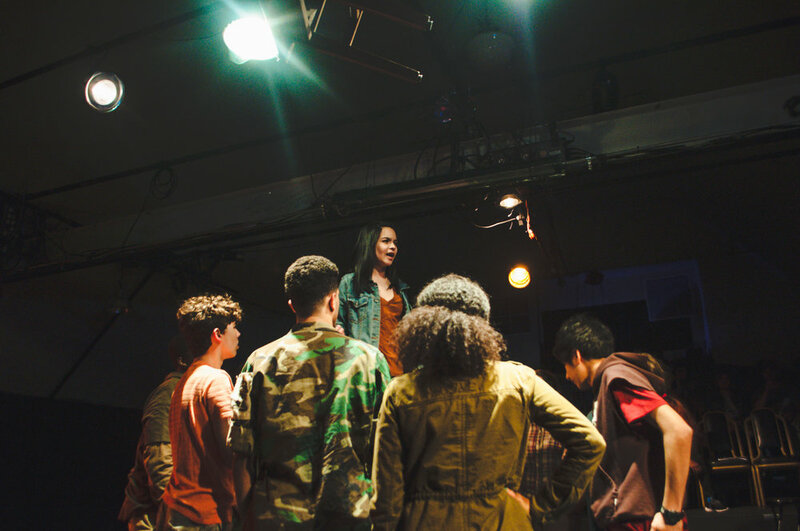 Each year, the ensemble investigates an issue affecting Chicago youth. We interview, research, create, throw away, write, take naps and after 10 months perform an original play about that issue. Free Street Theater creates theatre by, for, about, with and in Chicago's diverse communities; challenges the notion of who belongs in a theatre and where theatre belongs; and uses theatre to ask questions, prompt dialogue, and build community. Projects so far have focused on: mental health, how to make change when you can’t vote, radical love, rest as resistance, everyday miracles and currently water justice. Katrina leads the academic team at Albany Park Theater Project. With a focus on mathematics, english and ACT prep, Katrina meets with teen ensemble members 2-3 times a week. Additionally, Katrina served as a Production Assistant on APTP's production of Learning Curve.